Who doesn't love big prawns? Most adults love it as much as children - unless they're seafood allergic. 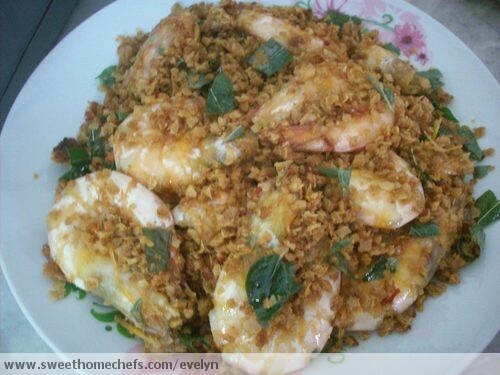 :-) One of my all-time favourite prawn dish is the ever popular Butter Cereal Prawns. You can find this usually served as one of the courses for Chinese sit-down course dinners in restaurants. But, for home-chefs who may not have the luxury time to painstakingly prepare the cereal-mix from scratch, you can get the instant pre-packed cereal mix/seasoning from supermarkets or grocery stores - which is what I had done for this occasion. It cut short half the preparation time and taste just as nice. 1) Heat up wok with a few tablespoons of cooking oil. 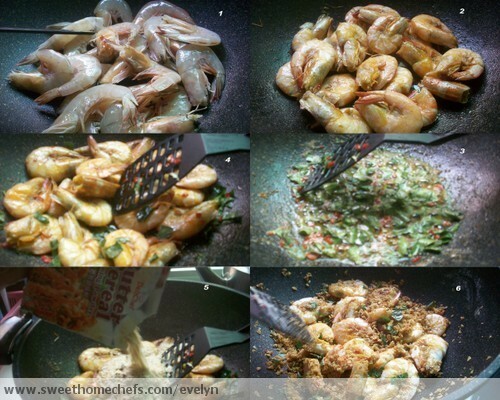 When oil is hot, add in the prawns and stir-fry evenly until the prawns had turned pinkish-brown and curled up a bit. Remove the prawns immediately as you don't want to overcook it. Set aside. Clear up any oil residue in the wok. 2) Using the same wok, you need not rinse, add in the butter and melt it under medium heat. Once its melted, add in the chili and curry leaves immediately. Stir-fry until its fragrant and add in the prawns. 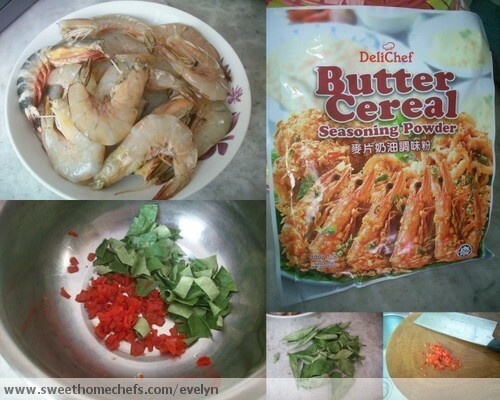 3) Stir-fry the prawns evenly for a little while, then add add in the cereal pre-mix. 4) Under very low heat, stir the prawns thoroughly until all are covered with the cereal. When the cereal mix had turned crispy after soaking up the excess butter in the wok, dish up the wonderful prawns and serve it hot. - I did not de-shell my prawns as I prefer it in its original form for more crispiness. I only snipped off the head's front pointy part where the whiskers are and trimmed the legs. - Instead of normal chili, you may go for a hotter taste by choosing bird's eye chili. - Instead of stir-frying, you may deep-fry it if you prefer for the ultimate crispy crunch. Wow! This recipe is very awesome! It looks very elegant. I think this dish is made for those who love to eat prawns, because it is the main ingredients here. I will try this when I get home. Thank you for sharing this!